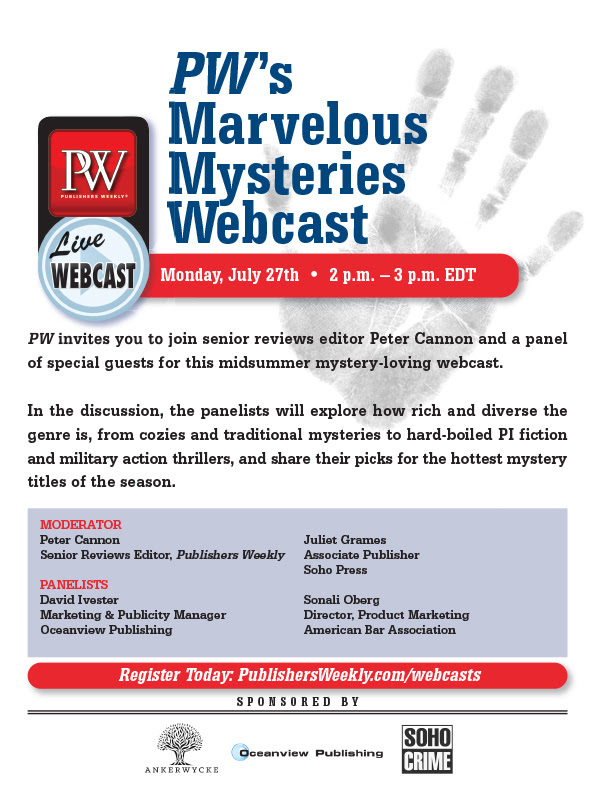 Just a heads up – PW is inviting you to join senior reviews editor Peter Cannon, and a panel of special guest publishers for a mid-summer mystery-loving webcast. In this discussion, the panelists will be exploring how rich and diverse the genre is, from cozies and traditional mysteries to hard-boiled PI fiction and military action thrillers, and sharing their picks for the hottest mystery titles of the season. This entry was posted in Events and tagged #BerkeleyMysteryFiction, David Ivester, Detective, Juliet Grames, Modern Mystery, Peter Cannon, Publishers Weekly, Sonali Oberg, UCBerkeley, webcast. Bookmark the permalink. This should be exciting! I hope to “see” some of my students on Monday! @wordsandpeace Many thanks for the title suggestion!